You'd be hard-pressed these days to find anyone whose to-do list is not a mile long; full of appointments to keep, deadlines to meet and everything else under the sun. Workdays extended by technology that lets us work from anywhere, social media feeds that follow us everywhere and the unending flood of information that comes pouring through phones, tablets and now even watches, is leaving many of us scrambling for someplace quiet to unplug. Because of this, it’s more essential than ever that we use the space we have at home to create room for peaceful rejuvenation at the end of every hard day. Some rooms, like living rooms and bedrooms, make this easy. But turning the whole home into a peaceful haven means bringing that same sense of serenity to tougher rooms such as your bathroom, the kitchen, and home office as well. By making some simple design choices, your least relaxing room can become your new oasis. Color impacts our moods, as researchers at Minnesota State University have recently affirmed. According to their findings, reds and oranges tend to stimulate the brain, while greens, blues, and neutral earth tones are more soothing. So if you're looking to your turn your bathroom into your own in-home spa retreat, it's a good idea to plan your color palette around a single, tranquil hue. In the same way that natural colors will calm, so will natural textures. Wood, marble and stone are all excellent options that combine interesting textures with soothing neutral colors. The same holds true for bath accessories as well. For example, choose natural sponges over plastic loofahs. Your body and your brain will thank you for it. Small changes in color and texture can immediately begin to alter the energy of the space. The right lighting is important for creating a relaxing atmosphere in any room. In the bathroom, candles are often the mood lighting of choice. But when the occasion doesn't call for that kind of time investment, a useful alternative can be to install dimmer switches on overhead lighting. That way you can suit the lighting to the moment without the having to deal with the cleanup required by candles. Wall sconces and hanging Moroccan lanterns are also great choices for creating gentle lighting while adding a global touch to your bathroom decor. It may seem a bit ironic to want to give your home office a relaxing makeover—but just because it's where you go to work, that doesn't mean that you have to be tense while you're there. In fact, given the health implications of work-related stress and the physical toll of sedentary working conditions, the office might just be where these changes will benefit you the most. Addressing your physical needs while working is the first and most important step. Ergonomic chairs and keyboards are essential to keeping the body relaxed and in good posture while working. The office is an ideal location for design choices that stimulate your other senses as well. Adding aromatherapy to the air through an essential oils diffuser can do wonders for keeping your mind alert and active while simultaneously calming your nerves. 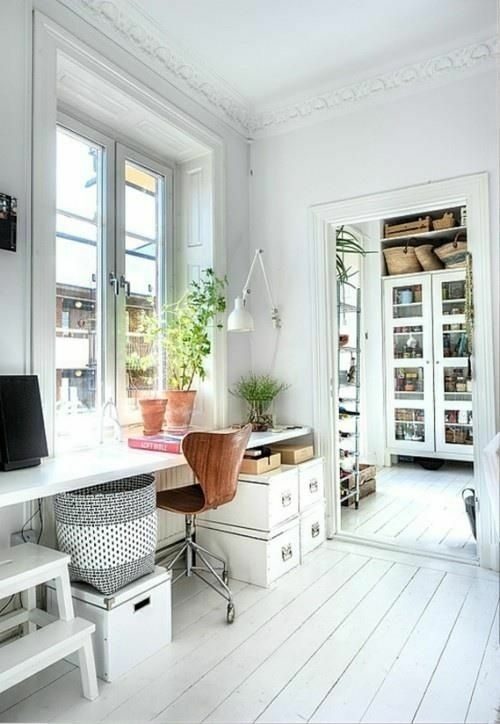 Even if work is keeping you indoors, bring in little pieces of the outdoors to keep you company. Potted plants are a wonderful way to do just that. More than just providing a natural element, plants add a pop of soothing green to your color palette while offering the bonus of naturally purified air. If being near the water is your happy place, a small fountain, a miniature zen garden, or a collection of your favorite seashells would all be great ways to bring the beach into your office space. The rules are a little different in the kitchen. The colors of walls, floors, and countertops tend to be neutral as a start, and natural wood and stone textures are often the norm. So instead, to make the kitchen feel like a sanctuary, you'll want to find ways to bring in the same decorating style that personalizes the rest of the house. Instead of toning down the color in the kitchen, look for ways to add bright pops of color that will break up the neutral blocks of color that likely already characterize the space. Small moments work best: a bowl of colorful fruits in the center of an island countertop or an arrangement of colorful carafes next to the sink. And if you have colorful plates and bowls, consider investing in clear cabinet doors that will allow you to create displays that highlight some of your more colorful pieces. Your best option for bringing color to the room, however, is art. Not only does art add a needed burst of color to the walls in your kitchen, it also allows you to bring in some of the same design aesthetic that personalizes the rest of your home, so that a bit of what brings you peace in the living room can follow up you into the kitchen as well. Of course, the thing that is most likely to make your kitchen more relaxing is seating. If there's no dining room adjoining, most kitchens have nowhere to sit at all. This not only makes long cooking stints more difficult, it keeps guests on their feet when visiting the place where all of the good food is being prepared. Bring a line of stools up to the edge of your kitchen island, or create a small bistro setting with a few Thonet chairs and a small table. And while not every kitchen has room for a whole seating section, many will allow for at least one or two well-placed pieces, such as a grouping of small poufs. Like art, seating will bring a bit more of the overall home into the kitchen, while providing a bit of refuge from the standing marathons that can are all too often the cost of a good meal. Your decor will get a boost, and your feet will thank you.